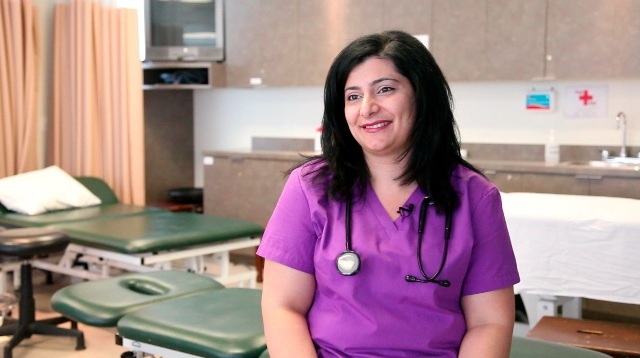 Nada Khairallah was a successful physiotherapist in Lebanon, but she was looking for more. And she believed that she could find new opportunities in Canada. She applied for immigration in 1999 and was on her way to a new life in Canada. When dealing with the Canadian embassy, she was informed that to work in Canada as a physiotherapist, she would have to go through a credentialing process before she could practise. Undaunted, she contacted the Canadian Alliance of Physiotherapy Regulators to enquire about the steps she would have to take. Her first step, she was told, was to take two online courses to prepare for a certification exam in Canada. She wasted no time, and began the classes while still in Beirut. She completed the courses in September 2004, after moving to Canada in April. “I thought when I finished my courses in September I would be eligible to write the exam,” she says. She also expected that she’d be able to work in her field directly afterward. Unfortunately, things weren’t that simple for Khairallah — she failed the exam. “I didn’t know I will be struggling with my written exam,” she explains, claiming that the online courses didn’t help prepare her well enough. “Communication is key for practising physiotherapy and with these courses you have (only) your questions that you need to reply to by the deadline.” There is no communication or collaboration with other students. Khairallah adds that she was “devastated” after learning that she failed. But she didn’t lose hope. “[I decided] I’m going to study again, take the exam and pass,” she remembers. She signed up to take the exam for a second time. But, as her preparation remained the same, so was the result. Determined to be certified in her field, Khairallah put her name down for the exam a third time. This time, she contacted a few local universities to check the possibility of taking in-person courses specific to the areas where she was having problems in the exam. After an unsuccessful third attempt at the exam, Khairallah decided to take a break. She wanted to take time to improve her English skills and participate in a pilot project at the Michener Institute in Toronto. Plus, she needed to prepare for her wedding, too. She also decided to do some volunteering in a clinic and hospital to gain some hands-on experience in Canada. Someone less determined might have surrendered to all the pressure and given up, choosing instead to focus on changing careers. Khairallah, however, had a clear goal in mind, even while having to work in retail to make ends meet. Her pregnancy forced her to take another break before going for a fifth try at the test. This time she approached it differently, creating a five-month plan of action. She studied together with another person who had failed her first attempt. They went through different books and exam templates, analyzing the answers and comparing them. Five years and five exams later, Khairallah was finally successful. She had passed her written exam and now could proceed to the clinical one, the second and final step for her certification in Canada. She is grateful for having enrolled in the bridging program, during which she learned about job-finding skills, such as writing résumés and answering questions during job interviews — things she didn’t know much about before. Through the bridging program, she also got two job placements: one at Sunnybrook Hospital in downtown Toronto and the other at William Osler Hospital in Brampton. And two months after finishing her second placement, she applied and successfully got hired for a position there. To avoid facing a similar struggle as the one she experienced, the now practising physiotherapist recommends to recent newcomers with a physiotherapy degree to take the bridging program as soon as possible. “If they go through the program, everything will be easier. The network that you build [through] the program is amazing and irreplaceable. You cannot find it anywhere,” she says, adding that the program also helps students to better understand how to approach patients and how to communicate with them, both of which are different in Canada. Khairallah also notes that Canadian hospitals find a huge difference between physiotherapist newcomers they hire who took the bridging program and those who didn’t. Khairallah passed her clinical exam in June 2011. Although she is now a fully registered physiotherapy practitioner, her dreams do not stop here. Her final advice? “Read carefully all and any instructions given,” without skipping a word!